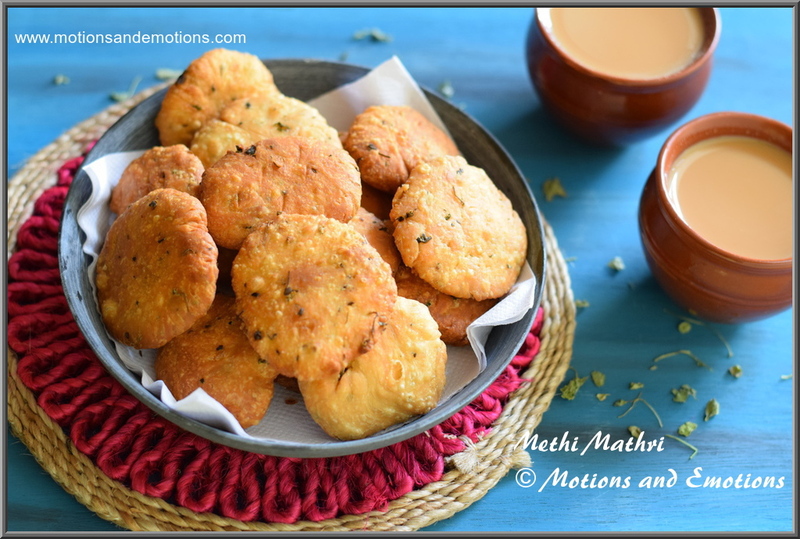 Methi mathri is a popular tea time snack from Northern India. Festive seasons like Diwali and Holi are incomplete without this deep fried snack. Dried fenugreek leaves gives a special flavour to this mathri and you will love the crispy and flaky texture of it. Being grown up in Eastern part of India I do not have any fond memories of mathri however we used to enjoy kucho nimki, tinkona nimki and elojhelo nimki. These are the snacks bring back the memory of childhood festive season. Mothers and Grandmothers used to start the preparation of making 'namkeen' (savoury) and 'mithai' (sweets) week or 10 days before the festival. They used to make in batches and I remember half of it would be over before the festival day comes and they used make another batch to refill the 'dabbas' (jars). My first experience of methi mathri was from a store bought packet which was good but I did not get the real taste until I prepared it at home. 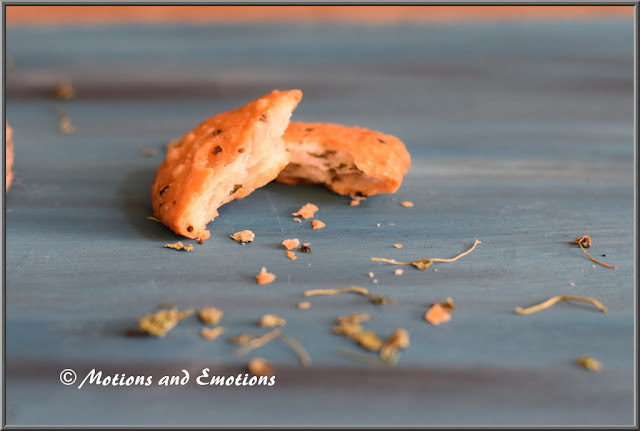 When you take a bite of it, you will experience a blast of flavours in your mouth as it contains dry methi leaves (kasuri methi), ajwain and crushed black peppercorns. There are two versions of methi mathri: one is thin and the other one is little thick. Thin one is similar to chips and I found it little hard in texture. However, the thick one is totally different from the thin one as it has several layers inside it which makes it crispy, crunchy and flaky. Check the below image, you can see the layers inside the mathri just similar to puff pastry. Methi mathri is an easy and tasty snack and requires minimum ingredients to prepare it at home. You find all the ingredients in your pantry so anytime you can prepare this snack and enjoy with a cup of tea. Can I store Methi mathri? If yes, how can I store them? Yes you can store methi mathris. After frying the mathris take them out in a kitchen napkin to soak the excess oil. Later allow them to cool. Once cooled completely store in an air tight container for a week. Can I use oil instead of ghee while kneading the dough? Yes you can use oil instead of ghee. However, ghee gives a better texture and makes flavourful mathris. Why my mathris are soft inside but outside totally golden brown? This is a common problem and many people complaints that their mathris don't turn out flaky and crispy instead soft inside. First of all you have to knead the dough well which I have mentioned in the recipe procedure. One more important fact is the way of frying brings a lot of difference in the taste and texture. It is important to fry the mathris under low to medium heat. So that the inside cooks well as well as outside does not burn. 1. Take flour, kasuri methis, salt, ajwain seeds and black peppercorn in a bowl. 2. Add ghee to the flour mixture and mix. While mixing the ghee with flour, rub with your fingers till it becomes coarse crumb like texture. 3. Next add cold water slowly little by little to make the dough. Dough should be stiff and smooth. 4. Cover the dough and allow to rest it for 15 minutes to half an hour. 5. After that take the dough and divide it around 20 to 25 equal portions (numbers vary depending on the size). 6. Meanwhile pour oil in a wok and put it on the gas under slow flame. 7. Now take each portion and roll it round and finally flatten slightly using your palm. Follow the same steps for all the portions. 8. When the oil is hot enough, drop the mathris (not all at a time, fry them in batches) into the oil. Fry them on medium heat until both the sides turn golden brown. 9. Once they are don, slowly take out the mathris on a kitchen napkin to soak the extra oil. 10. Allow them to cool completely and later you can store them in air tight container in room temperature. They look like a great afternoon snack with some tea! The mathris look so tempting Amrita. We usually make the flatter version but this is different and worth trying. Methi always adds a delightful taste to mathris. I too remember when my kids were young that any namkeen we prepared at home for festivals barely made it to the festival day. My mother in law would have to hide some for the festival day. I've never heard of this but would love to try it! It sounds really delicious! Thanks for sharing! Methi mathri reminds me of my Grand mom, who used to make it the best. This one snack we loved to carry in our tiffin during school days. Your.mathris look fab. Methi mathri are delicious, they make a good snack with a cup of tea. love mathris any time with a dash of pickle..perfectly made ! 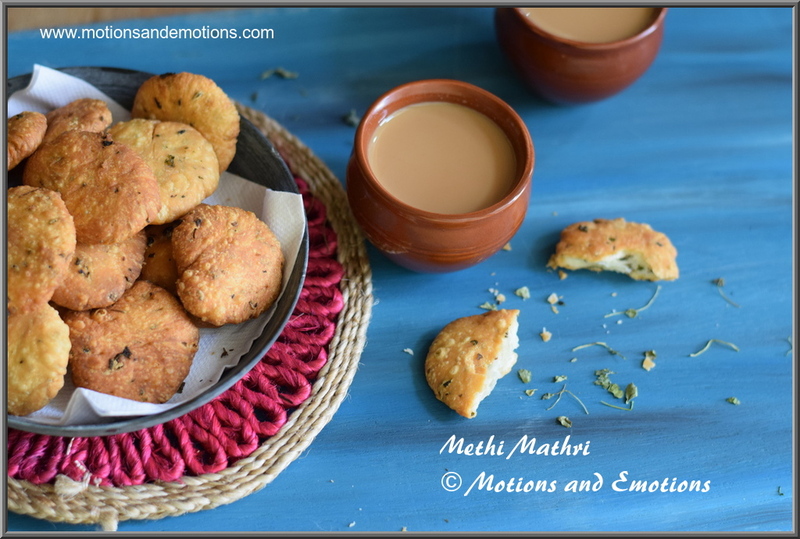 Methi mathri is one of my favourite tea time snack, and these beauties are perfect for holi celebrations. Wow... The methi mathris are so crispy and flakey. Feel like grab some from the screen. You said it right perfect kneading and frying in right temperature are the keys. 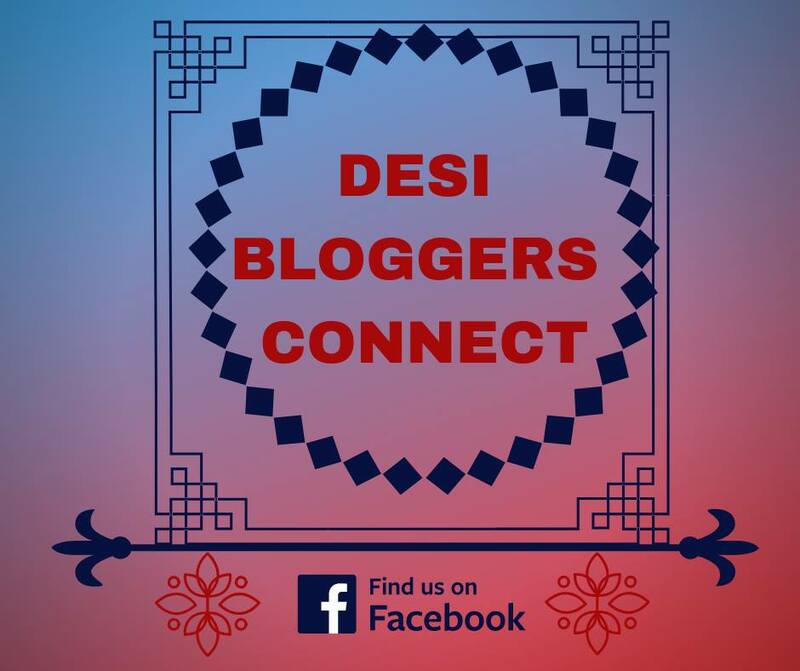 Perfect share for Holi. 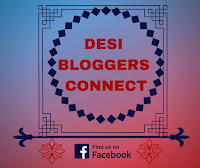 An advance HAPPY HOLI! Love the flavor of methi in anything especially matris! I could have these with some hot, hot, kadak adrak chai! Fabulous share dear! 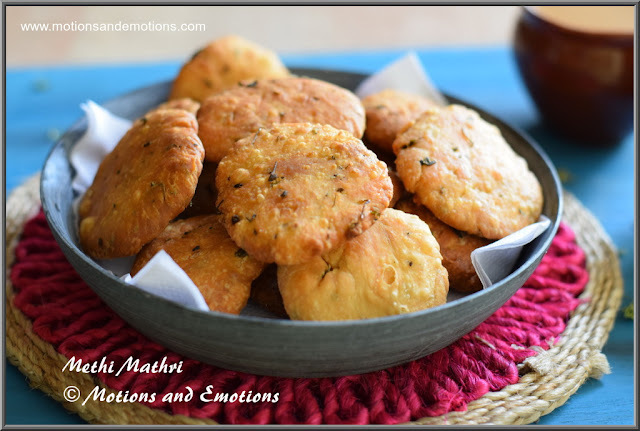 Delicious mathri’s, so well explained on how to get perfect crispy mathri. Perfect savory snack to enjoy this holi! The Mathri’s looks so crispy and flaky.Long time back I made these ones. But your looks absolutely delicious.Happy Holi. Actually we love methi mathri, anytime of the year. Yours look absolutely khasta (a word used for crisp mathris ) and delicious!